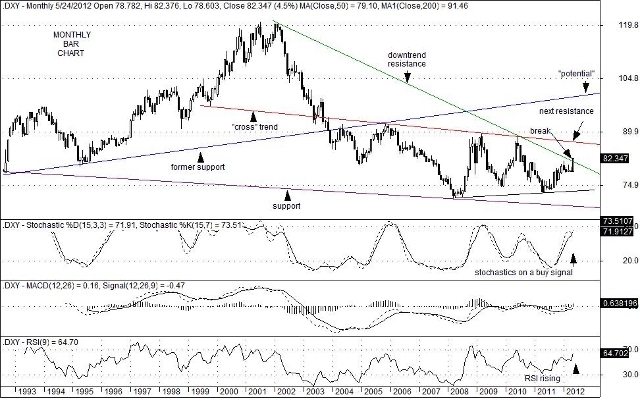 Supported by modest economic growth in the United States and the likelihood of a recession in Europe, the U.S. Dollar Index (DXY) broke above primary downtrend resistance at the 81.25 level. The expectation of slower growth in China, or the possibility of a harder-than-expected “landing” in that country have also bolstered the greenback with dollar shortages emerging in places like Indonesia and Venezuela. Recent concerns over the solvency of a number of Greek and Spanish banks have also added to the preference for dollars. While not yet in an overbought condition on the monthly time frame, the likelihood for further dollar strength is reasonably high. When looking at longer-term charts, the next key trend line resistance level on the DXY sits at 86.85, although it declines over time. Nevertheless, a move toward that level would likely be accompanied by continued political and financial uncertainty in Europe, which in turn could have a negative impact on China, India and Japan. In addition, further dollar strength would likely have a negative affect on U.S. equities and commodity price which could send 10-year U.S. Treasury note yields to new all-time lows. This entry was posted on Thursday, May 31st, 2012 at 11:20 pm	and is filed under U.S. Dollar Index (DXY). You can follow any responses to this entry through the RSS 2.0 feed. You can leave a response, or trackback from your own site.